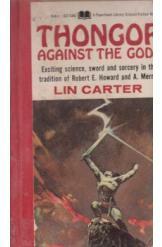 Thongor Against the Gods by Lin Carter, Sci Fi. Book is in good condition, all pages intact. A simple quest - rescue the princess - turns into a battle of cosmic proportions when Thongor is confronted by the followers of the Black Gods of Chaos. Part of the Thongor series.